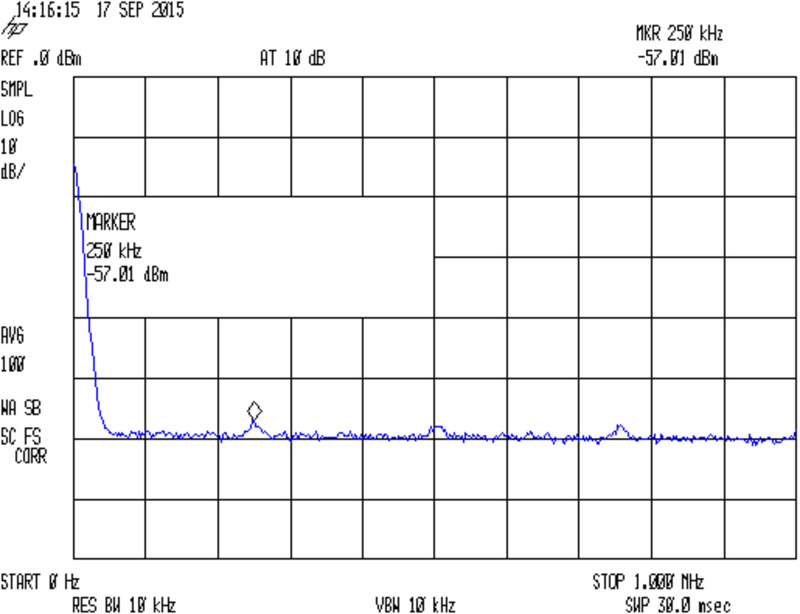 In fact, it’s down 3 dB at 4 MHz, 10 dB at 10 MHz, and has some pizzazz out through 50 MHz. The cursor marks the second harmonic of the 125 kHz SPI clock that’s shoving bits into the shift registers that drive the LED display. In principle, you can’t get 250 kHz from a 125 kHz square wave, so we’re looking at various & sundry logic glitches that do have some energy there. The big peak at 0 Hz comes from the LO punching through the IF filters; I should have set the start frequency to 9 kHz (the HP 8591 spectrum analyzer’s lower cutoff frequency) to let the filter get some traction. 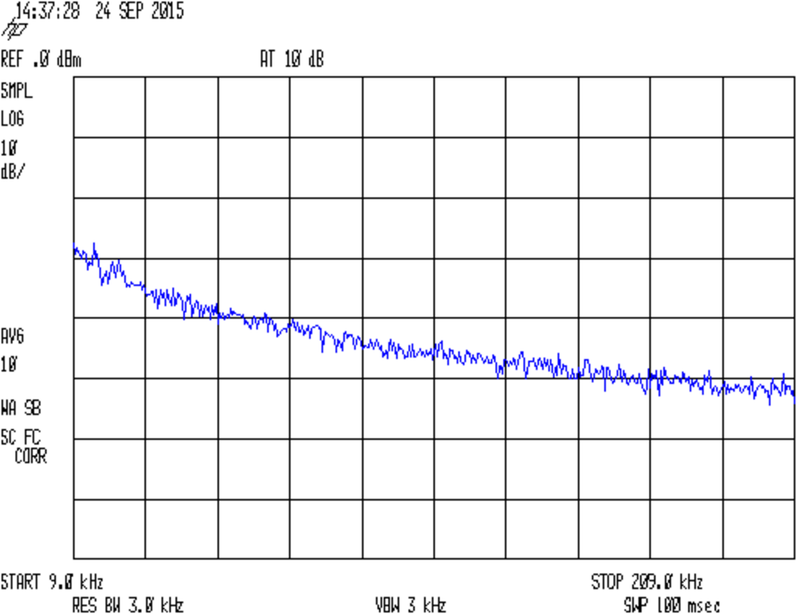 Past an op amp’s -3 dB cutoff, the response drops at 10 dB/decade for a while. Squinting at that curve, it’s down 10 dB at 40 kHz and the cutoff looks to be around 4 kHz… not the 100 kHz you’d expect from the GBW/gain number. The LM324 has a large-signal slew rate of about 0.5 V/µs that pretty well hobbles its ability to follow full-scale random noise components. Both traces come from a kludged 10 dB AC coupled “attenuator” probe: a 430 Ω resistor in series with a 1 µF Mylar cap, jammed into a clip-lead splitter on the BNC cable to the analyzer. Probably not very flat, but certainly good enough for this purpose. The SA is averaging 100 (which was excessive) and 10 (more practical) successive traces in those pix, which gives the average of the maximum value for each frequency bin. That reduces the usual hash you get from a full-frontal noise source to something more meaningful. 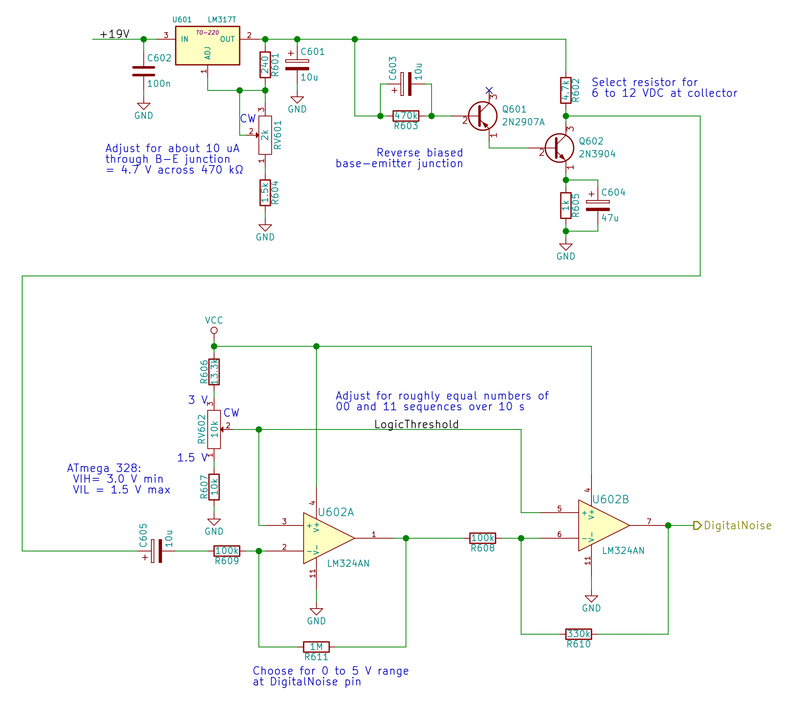 This entry was posted on 2015-09-29, 07:38 and is filed under Electronics Workbench. You can follow any responses to this entry through RSS 2.0. Both comments and pings are currently closed. It’s nice to actually see the effects of limited slew rate, and how they can look like GBW falloff. This is, of course, exactly the sort of thing I was hoping to see when you meantioned “pedagogic reasons”. Components aren’t ideal, and their properties have definite effects, which can and will pop up and bite you. Learning to recognize when and why this happens is a long journey, that we’re all still on, and sharing information like this helps us all.